YouTube does not provide a way to directly download videos from their site. That's probably because they want you to visit their ad-supported webpages. Why would you want to download videos from YouTube? Well, there are lots of great educational videos there. YouTube is blocked in most schools, so teachers who want to use these videos in their classrooms have to download them from home and bring them to school. Also, in order to view a YouTube video on an iPod or other portable player, you'll need to have it downloaded. The videos on YouTube are in Flash format (those are videos that end with the .flv extension). So, even if you manage to save the .flv movie file, you have to either convert it to a different format or find software that will play it. After a video is downloaded and converted to the proper format, you can sync it onto an iPod or put it in PowerPoint slide shows or edit/remix it using video editing software like iMovie or MovieMaker. I often use Zamzar.com to download videos from YouTube and convert them into the MPEG-4 format that iPods and QuickTime love so much. In four easy steps you paste the YouTube URL into Zamzar.com, select the video format (likely .mp4), and input your email address. After clicking Convert, Zamzar will put your request in a queue. Once it has processed your request (usually between 15 minutes and 2 hours), Zamzar will email you with a link to download the converted movie. Now there's a new site that is even simpler than Zamzar. It's called KickYouTube.com. You don't need to copy and paste the video's URL, install any software, or wait for an email. Here's how it works. 1. Find the video you want to download on YouTube. Many videos on YouTube are now in High Definition. If the video has a "watch in HD" link below it, click it so you'll be downloaded the larger video size. 2. In the address field, type kick in front of youtube.com and press Enter. 3. 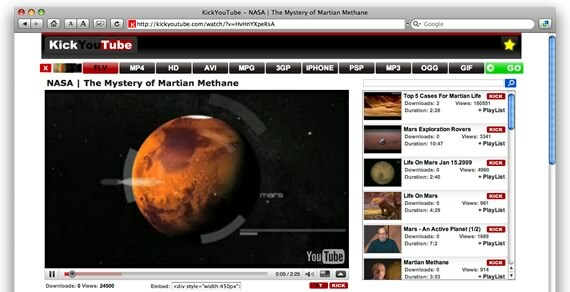 You are taken to the KickYouTube site, showing the video from YouTube. Across the top of the page are download options: FLV, MP4, HD, AVI, MPG, 3GP, iPhone, PSP, MP3, OGG, and GIF. 4. MP4 is almost always my choice, so I click it. Then I click the Go button where I get this message below. So I just right-click (or Mac users can Control-click) that green Go button and save the video file to wherever you want on your hard drive. Now the video on is on the hard drive. It can be put on a flash drive, burned to a DVD, imported into move editing software, put it in a slide show, or whatever you like to do with video files. Very similar to KickYouTube is PWNyoutube.com. Just add pwn in front of youtube.com when viewing a video and it will take you to a page where you can download that video. 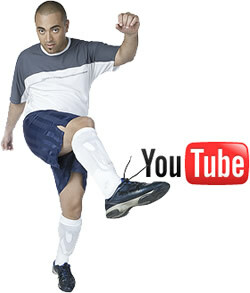 With YouTube in their URLs, I'm guessing that Google (the company that owns YouTube) won't stand for their trademark being used in other web addresses, so KickYoutTube.com and PWNyoutube.com services may not be around for long. YouTube may one day offer downloads directly from their site. In fact, a "Download this video" link can be found on pages for President Obama's videos. When clicked, the link will download an MPEG-4 video to your hard drive. If this becomes an option on all YouTube videos, services like Zamzar and KickYouTube or software like Real Player and TubeSock won't be necessary for downloading videos. Please note that downloading videos from YouTube may go against YouTube's Terms of Service. Also, the video creator's copyright should be respected and acknowledged at all times.